While there will be some couples who are insistent on having a summer wedding, there is never a bad time of year to get married. For many people and couples, autumn is the most romantic time of year. The weather is cooler, but not too cold, ensuring that there is great scope for long and romantic walks. As you walk, the changing colour of the leaves and the increased opportunities for gazing on the setting sun and the twilight provide the ideal opportunity to spend quality time together and let love flourish. The striking reds, golds and browns that you find in nature at this time of year create the perfect backdrop for any event, and it is this majesty that the Mr & Mrs Autumn wedding invitation from Bunny Delicious brings to the fore. It is a simple wedding invitation, a bride and groom surrounded by some falling leaves and the couple’s initials underneath them. It provides exactly what you need to know and delivers it in great style. There is also a rather ostentatious red bow at the side of the invitation, in case you were worried about the card not being grand enough for the special occasion. 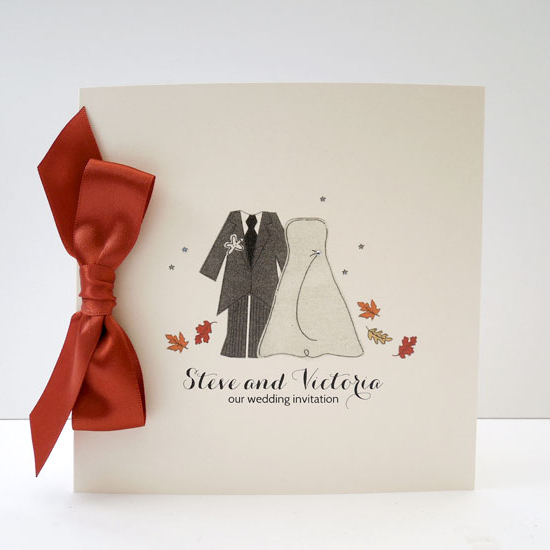 If you have decided on an autumn wedding, what better way to remind your guests of when the wedding will be than with an invitation that is themed around the season? Summer weddings can become interchangeable, especially if guests have a run of them in quick succession, but an autumn wedding feels more special. If you are looking to celebrate your love at one of the most romantic times of the year, it is important that you have a wedding invitation that befits the occasion and time of year.